This morning in Los Angeles, Electronic Arts kicked off E3 2018 with a press conference in which they announced a new Star Wars game, an Unravel sequel, and took a longer look at BioWare’s upcoming RPG Anthem, which is out next February. It was a straightforward way to begin E3: light on major news, with a focus on games we already knew about. Here’s everything EA showed and announced. Battlefield V gets more destructible environments and a battle royale mode. The next Battlefield game will bring back the destructive environments that DICE ran wild with in Battlefield: Bad Company. In the World War II-based Battlefield V, tanks can blast through buildings and destroy cover in real time. Also, your character can dive-roll through windows? Hell yeah man, I’ve always wanted to do that in a game like this. “No loot boxes. No premium pass,” the developers reiterated on stage. They also announced “royale reimagined” for Battlefield, meaning that Battlefield V will be getting a battle royale-style gameplay mode. I’m shocked. Shocked, I say! The developers said they’ll have more to share on that mode later in the year, and we’ll see more of the game at Microsoft’s Xbox conference tomorrow. Respawn’s Star Wars game is called Jedi: Fallen Order. Respawn’s Vince Zampella confirmed that means you’ll be playing as a Jedi, lightsabers and all. The game takes place “during the dark times” between Revenge of the Sith and A New Hope, when the Jedi are being hunted. Per EA on Twitter, it’ll be “an original Star Wars story around a surviving Padawan set shortly after the events of Star Wars: Episode III.” It’s coming in holiday 2019. Battlefront II is taking on the Clone Wars. Star Wars Battlefront II is getting a bunch of new stuff this year, including a new squad system, a new starfighter mode, a new command-post capture mode, and new heroes and maps taken from the Clone Wars. There will be new heroes including General Grievous, Obi Wan Kenobi, and Anakin Skywalker. Unravel Two brings Yarny back for a co-op adventure, out today. It looks as cute as the first game, but has a co-op focus that has both players using their yarn abilities to swing around and avoid hazards. They were sure to stress that you can play it in single-player, if you want—the other yarn character just wraps itself around Yarny and you can control them both. The demo also had this weird bird chasing the yarn creatures around, and it was pretty stressful. Go away, bird! EA also pulled the first Beyoncé of E3, announcing at the end of the presentation that you can buy the game... today! It’s on PS4, Xbox One, and PC. Sea of Solitude is all about loneliness and depression. It’s another EA indie, this time from German studio Jo-Mei Games. The game was introduced in a winningly wandering way by writer/creative director Cornelia Geppert, who seems pretty great. It’ll be out in early 2019. Command & Conquer is returning as a mobile game. After those announcements, EA hosted a resoundingly unexciting stage demo of a new competitive Command & Conquer mobile game. It’s called Command & Conquer: Rivals and it definitely looks a competitive mobile RTS. I don’t really know what else to say about it. You can watch a gameplay overview here. 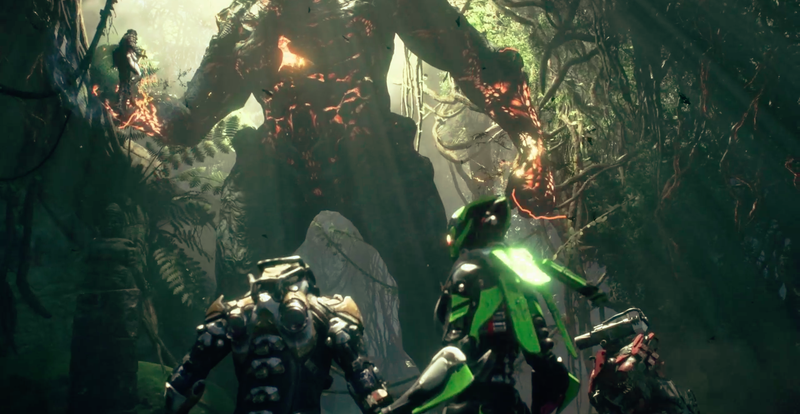 We learned more about BioWare’s Anthem, coming in February. As we already knew, the sci fi action game is designed about the “Javelin” exo suit you wear. Since your character is a person who wears the suit, you can change your suit whenever you want to fit the mission or your team makeup. So basically, Javelins are changeable character classes. The game’ll be out on February 22, 2019. For more on Anthem, read this post compiling everything we’ve learned about the game. A few other things: We got a dramatic trailer for FIFA 19, which is out on September 28; an enhanced “Origin Access Premiere” subscription service is coming later this year that’ll give full access to EA’s big PC games; Madden is coming to PC; We got a trailer for Madden Overdrive; and EA CEO Andrew Wilson talked up their “Play to Give” program supporting various charities. And that’s it for EA! Feels like last year’s EA press conference was just last week. But no, it was an entire year ago. You are now a year older than when you first found out about A Way Out. I’m not, though. Every year, I stay the same age. We’ll be here all week covering every E3 press conference and with news, interviews, and hands-on impressions from the show floor. Stick around.